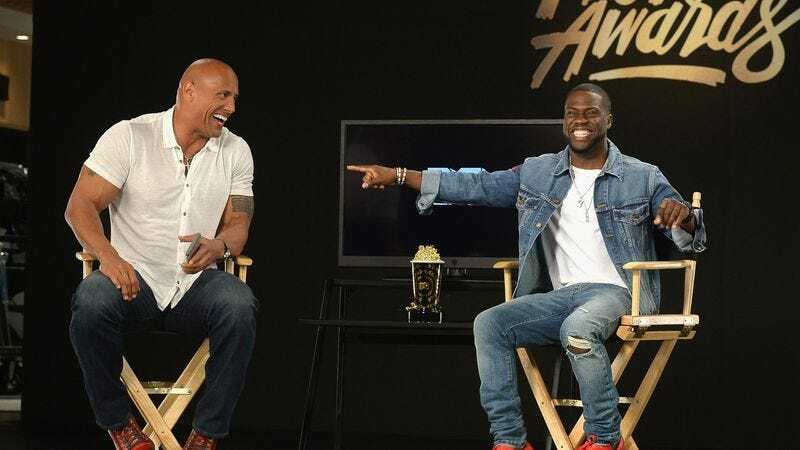 It’s official: Having finished shooting on their upcoming spy comedy Central Intelligence, and then hosted the MTV Movie Awards together, Kevin Hart and Dwayne Johnson are now Buddies, the most sacred relationship two straight men in Hollywood can have. As such, the pair are both obligated—and privileged—to periodically Buddy Up in movies together from now until the end of time, or at least until their grouping is no longer profitable. To that end, Variety is reporting that the duo are circling the long-in-the-works Jumanji reboot, presumably while engaging in good-hearted ribbing, dating each other’s sisters, and setting their differences aside. The film is being directed by Jake Kasdan, whose past Buddy experience includes the Jack Black/Colin Hanks vehicle Orange County. (Sadly, the pair filed for Brovorce shortly after the film left theaters.) The new Jumanji movie—set for a summer 2017 release—is expected to be a remake of the 1995 original, which starred both Robin Williams, and the dynamic, screen-stealing pairing of Those Horrible Spiders With The Fat Bellies and The Nightmares Of Generations To Come. Hart’s other Buddy, meanwhile—Ride Along partner Ice Cube—couldn’t be reached for comment. But tabloids—which, to be fair, we just made up—are reporting that he’s deeply upset by Hart’s blatant palandering, finding solace right now in the warm, welcoming banter of his Fist Fight co-star Charlie Day.